The Endless Knot is a symbolic knot used in Tibetan Buddhism. The Endless Knot is also found in Mongolia. The Endless Knot is known as dpal be'u in Tibetan and shrivatsa in Sanskrit. 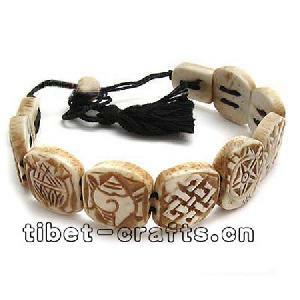 Other names for it are the Tibetan Knot, the Mystic Dragon, the Knot of Eternity, and the Lucky Diagram. The Endless Knot is one of the eight auspicious Buddhist symbols, known in as Sanskrit as Ashtamangala. The other seven symbols are a lotus flower, two golden fish, a parasol, a treasure vase, a conch shell, victory banner, and eight spoked wheel. The Endless Knot is an intertwined knot without beginning or end, symbolizing Buddha's wisdom and infinite compassion. While the form pictured from Tibet, various Celtic knots are interlocking and bear a striking resemblence to the Endless Knot. Symmetrical knots that tie into themselves without beginning or end possessing a certain harmonic grace and elegance.